Probably the biggest officially sanctioned tech story this week for PC enthusiasts was AMD's announcement of its 2nd Gen Ryzen Threadripper CPUs. Four new Threadripper processors were revealed on Monday but their availability will be staggered; with the 2990WX on-shelf and shipping on 13th August, the 2950X on 31st August, and the 2970WX and 2920X slated for October. As AMD readies its CPU releases, motherboard making partners are lining up new and updated products that offer upgraded power circuitry, cooling and a few more attractive extras to tempt new and upgrading AMD Threadripper customers. 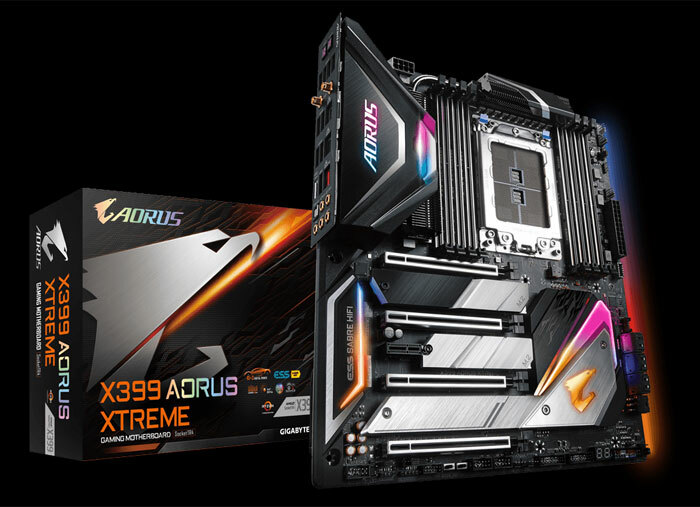 Earlier this week Gigabyte announced its "top of the line" X399 Aorus XTREME motherboard, designed for AMD's 2nd Gen Ryzen Threadripper processors with up to 32 cores. As indicated in the intro, the key upgrade with this motherboard, compared with previous X399 TR4 boards is an upgraded power section. 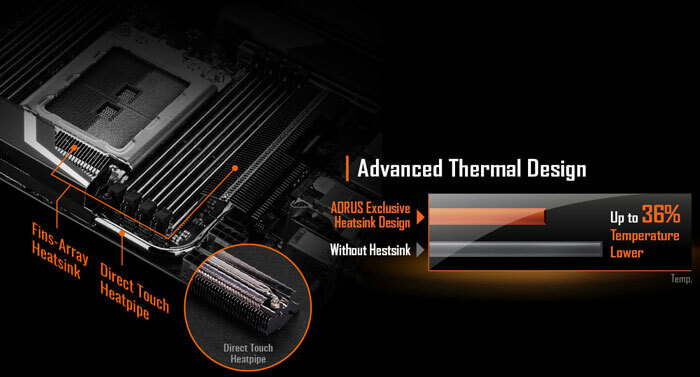 Gigabyte says that the X399 Aorus XTREME motherboard comes with a "10+3 power design using all digital PWM from IR accompanied by power connectors with solid pins allowing energy sensitive components to enjoy a precise and reliable power delivery". Where there's a concentration of power cooling is increasingly important and Gigabyte has implemented an upgraded thermal design across the board. Direct Touch Heatpipe tech is used in the VRM area in addition to a Fins-Array heatsink. If the passive cooling comes under pressure there is a pair of 30 mm fans located under the I/O armour. Last but not least a NanoCarbon base plate is said to reduce the temperature of components mounted on PCB backside of the PCB. HEXUS made a feature video of the MSI MEG X399 Creation motherboard at the Computex 2018 show in Taipei in June. You can check out that overview here. Today MSI has officially announced the product, reports TechPowerUp, as we near launch for the 2nd Gen Ryzen Threadripper CPUs. 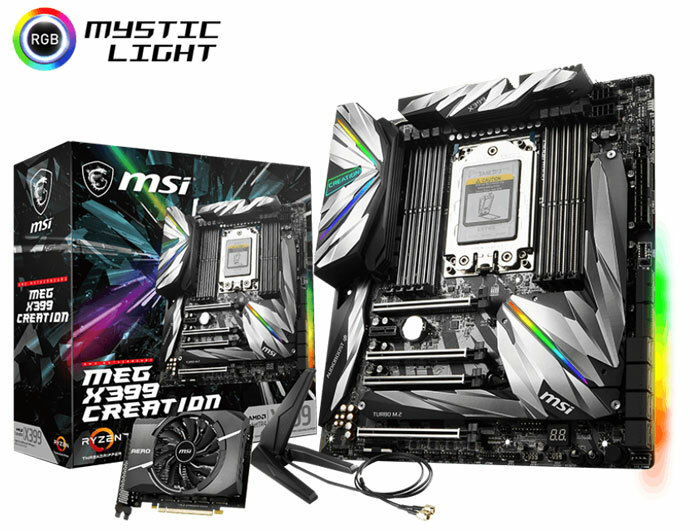 The official product page for the MSI MEG X399 Creation motherboard is available online now. You can dive on over there to check out the overview, specs, and even a gallery. However the story is pretty much the same as with Gigabyte's new product. It is designed for delivering maximum stable power to the new generation CPUs and provides bolstered cooling technology as well as some nice extras. MSI employs a 19 phase digital power design with heat-pipe heatsink, plenty of temperature sensors and fan headers distributed across the board. Described as a content creators board this product nevertheless, just like the Aorus board, fills out its feature list with RGB lighting (MSI Mystic Light) and aggressively styled armour. Dual Gigabit and a 10GbE?!? Someone has definitely been listening to feature requests! If I had a reason to buy a Threadripper, I would look at these boards at the top of my list. I don't normally like MSI, too much flash/bs most of the time. Form over function but these seem to have a healthy mix of both. Sorry but all those LEDs and “armour” gave me acid flash backs to ‘Nam. And when you're advertising “solid pins”, I'm assuming that this is some actual technical thing rather than merely advertising the fact that your fan headers are made of solid materials and are not gaseous? Yes, I wondered about that. Some power pins are split down the centre so they are slightly oversize. When they are inserted into the socket they comrpess slightly ensuring a really good contact along the length of pin/socket. A solid pin, unless precisely matched to the socket (turned pin connectors) don't get that ad so the contact pressure may be reduced leading to poorer performance. So without knowing the precise technical details, this sounds like a bit of meaningless marketing flumf. Going on what they claim on the marking for another board they say it makes a good connection and significantly lowers the wires capacity.